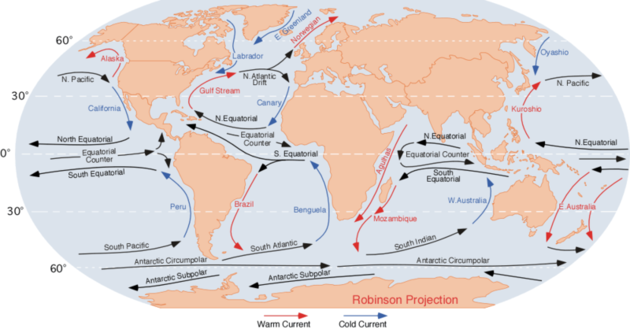 Gyres are large ocean currents circulating globally. Global wind currents create gyres. To understand how this works, click here for wind and ocean currents. Water temperature and salinity differences result in vertical mixing of the ocean. Generally warmer water rises, and colder saltier water sinks. 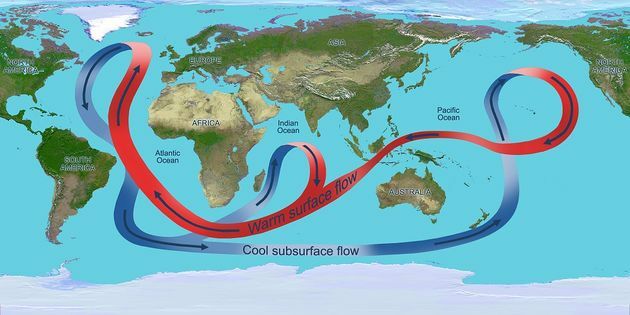 Gyres and the ocean conveyer belt distribute heat to other areas of earth that may not be as warm. Without the heat distribution around the earth, many climates would be different. Warm climates would be warmer, and cold climates would be colder. Precipitation amounts in areas would also differ. The gyre in the Pacific Ocean causes El Nino and La Nina. These are climate patterns that shift every few years, depending on the strength of this gyre. If there is a La Nina, it pulls warm water away from the West Coast, the water is colder than usual. This creates a lot of precipitation for the western seaboard and increases hurricanes in the Atlantic. An El Nino is a weaker gyre than usual, and warm water builds up along the western coast, resulting in opposite effects as La Nina. Gyres form Earth's ocean conveyer belt. The ocean conveyer belt is the movement of water resulting from temperature and salinity gradients, and global winds. It begins in the Norwegian Sea. The Gulf Stream carries warmer water there. At this point, the warm water begins to cool because of the loss of heat to the colder air. The water then begins to sink. The addition of water pulled north along the Gulf Stream forces the colder water to move southward. Remember, colder water will sink, so this starts a cycle. This water then moves southward to the Antarctic where density gradients cause it to move eastward. When in the Indian and Pacific Ocean, it warms and begins to rise. It then flows back westward and pushes back northward via the Gulf Stream to start the process again. A problem with gyres is that there tends to be a dead spot inside the gyre where it rotates, kind of creating a whirlpool. Pollution collects within this circular area. 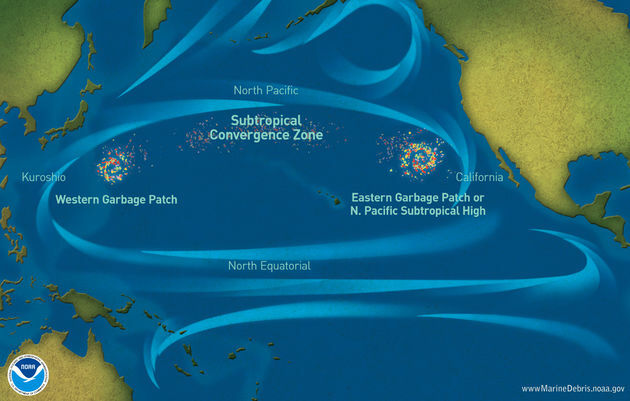 The image shows two large polluted areas within the Pacific gyre. They are termed the Western Garbage Patch and Eastern Garbage Patch. The pollution can include large pieces of trash all the way down to extremely tiny pieces of microplastic. Garbage is carried there from boats discharging their waste directly into the ocean, and human pollution carried from waterways and coastlines. Approximately 8,000,000 metric tons of waste are discharged to oceans each year. Plastic waste makes up a large portion of it because it is difficult to completely breakdown. This is harmful to the natural wildlife, as fish and birds may ingest the garbage. Birds stomachs can fill with this plastic, as they can't excrete it. This makes them feel fuller and they eat less, which ends up killing them eventually. Fish and other swimming organisms may get caught in the plastic, like plastic bags or the rings from soda 6-packs. Filter feeders and plankton that are eaten by other organisms transfer microplastics into them. This moves up the food chain. Are you eating fish or seafood with microplastics? 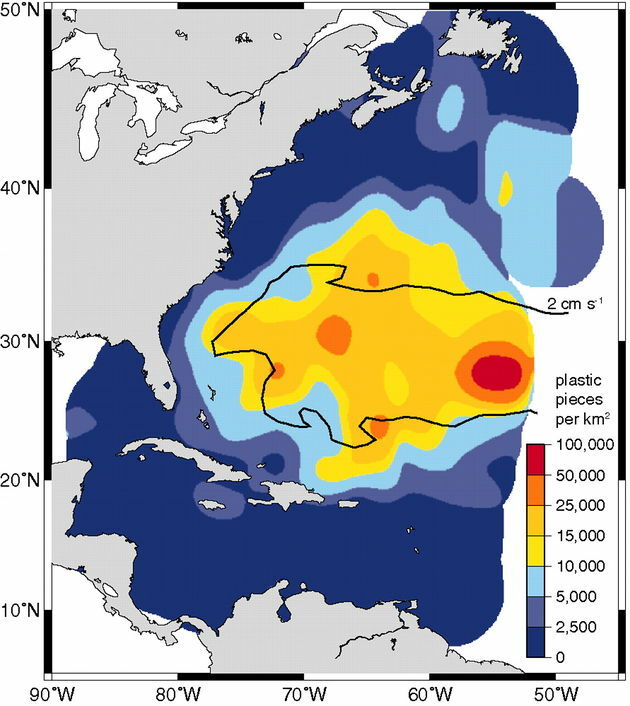 The image above show the areas where a large portion of pollutants resides in the Atlantic gyre. Notice how it is concentrated centrally, with an extremely high amount towards the eastern side of the gyre (like the Eastern Garbage Patch in the Pacific. These microplastics are finally being noticed as an extreme danger to wildlife. Plastics from garbage bags, lighters, soda/water bottles, straws, wrapper, etc. break down in the environment to form these micro-plastics. Photochemical degradation is the result of chemicals breaking down in the presence of the sun. Biological degradation is the result of microbes breaking down the chemicals. Stop purchasing products with extra packaging or that use plastic. This eventually makes its way to landfills or waterways. Not purchasing these products will let manufacturers know that they need to switch packaging methods. You can also find many products that indicate they are made from recycled products, or that are completely biodegradable; purchase these. Reduce your consumption of water via water bottles. First, mineral water is not equally monitored for contaminants as tap water. Second, using a reusable drink bottle, like a sports bottle, will reduce the amount of plastic generated. Always pick up litter that you find, especially near waterways. Clean up after yourself, don't be a litterer! Educate your friends on the damage done to the environment and wildlife from plastics and littering. MLA (Modern Language Association) "Gyres." ScienceAid, scienceaid.net/Gyres Accessed 23 Apr 2019. Chicago / Turabian ScienceAid.net. "Gyres." Accessed Apr 23, 2019. https://scienceaid.net/Gyres.